Last year I introduced a new logo designed by the talented Gentleman Josh Rucker for Nerd Girl Yarns. He did a great job bringing our spirit into the design and it now graces all of our tags, cards and bags. Yep, that’s Boy Genius under there. He isn’t completely fond of the name Fiber Optik but the techno fiber nerd in me thinks it is hilarious. I am very proud of his creativity and ingenuity to create Fiber Optik. I don’t want to give away any of his secrets but I am sure he will be happy to discuss his methods in person at Maker Faire. He will be making the rounds with some free buttons. 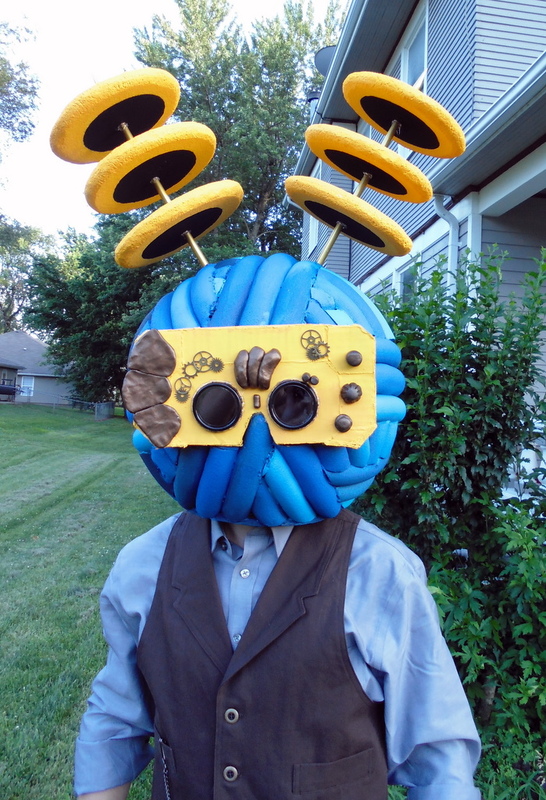 Our giant steampunk yarn head is debuting at Maker Faire KC this weekend and will also be traveling to all our booths in the future. Some artistic license was taken to try to bring him to life but I hope we have done the logo justice. Boy Genius claims this is only Mark I of the design and that improvements are to come (we never stop innovating around here). ← Maker Faire & Tour de Fleece starts Saturday!